This year marks the 100th anniversary of the University of Mississippi‘s Student Army Training Corps, which was formed while the nation was preparing future officers who would become part of the more than 2 million U.S. soldiers who fought in World War I. 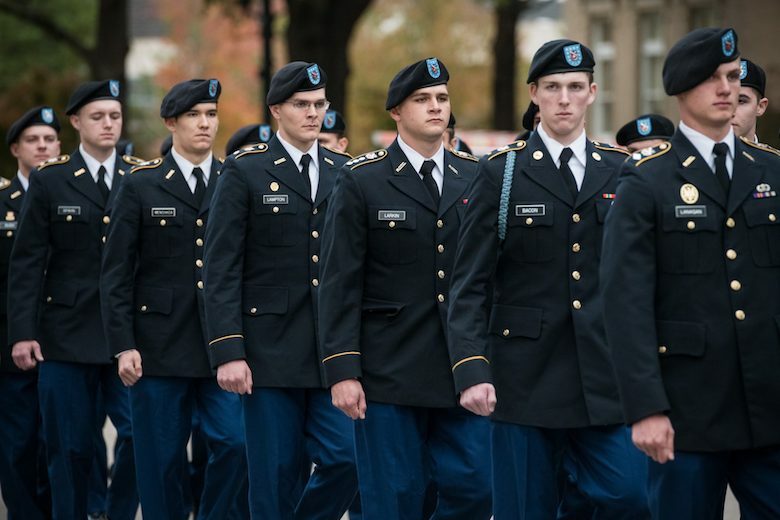 Today, the group is called the Ole Miss Army ROTC, and its alumni have fought and died in every U.S. war since it was founded. They’ve trained for every scenario of every era of modern warfare. Time with the program shaped its members in both their careers in uniform and in civilian life. Sarah Gunnells, a senior paralegal studies major from Tupelo, is a member of the Mississippi Army National Guard. In December, she’ll receive her Army commission as a medical service aviation officer, and after she graduates in June she will enter flight school to fly Blackhawk and Lakota helicopters. The draw to serve her country and get involved in Ole Miss ROTC was powerful, she said. She minors in military studies, as do all members of the ROTC, and is also minoring in music. She’s a violinist with the LOU Symphony Orchestra. Gunnells said she believes her experience at the university is very well-rounded, largely because ROTC exposes her to many situations and many different personalities. “We have a lot of opportunities to train with different kinds of cadre members because we are expected to do a lot of different jobs within the Army,” she said. “There’s also the camaraderie of being a student and also in the Army that is so beneficial to morale. 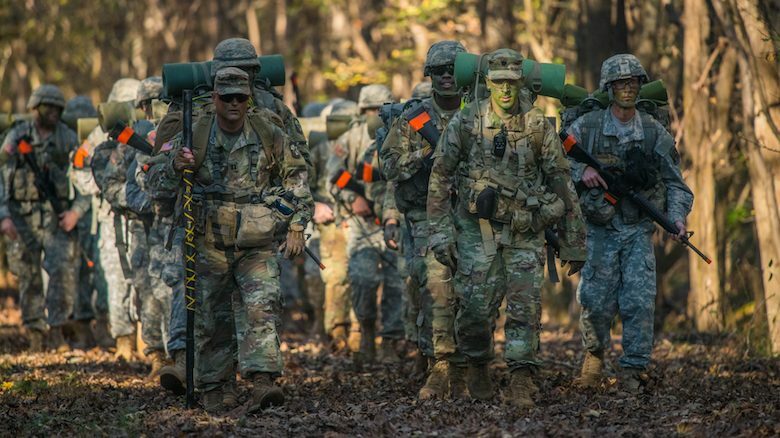 Training for the ROTC has evolved a lot over the last century to meet the demands of each era of warfare, said U.S. Army Sgt. 1st Class Anthony Douglas, UM program coordinator for military science and leadership. Most recently, cadets were being trained to interact with key leaders of villages in the Middle East until about two years ago. The approach since has shifted to be focused on ground operations in wide-open areas, such as the terrain of Afghanistan. The cadets utilize Mississippi National Guard installations for training exercise, including Camp Shelby near Hattiesburg and Camp McCain near Grenada. Once per semester, they attend joint exercises with other universities in Mississippi and neighboring states. Though the mission often changes, the end goal hasn’t changed much over the last 100 years, Douglas said. It comes down to how the future officers can lead troops when they do lab exercises each Thursday afternoon. The Ole Miss ROTC has a long, proud history. Retired Mississippi Army National Guard Maj. Gen. Buddy Chain was a member of the Ole Miss Army ROTC in the early 1950s. The 83-year-old did two years on active duty with the Army before entering a 32-year career with the guard. He retired in 1998. Chain, of Oxford, looks back on his time with the ROTC fondly. In fact, he still carries on one skill he learned in ROTC. “One of the things that everybody that knows about me is that I can shine the hell out of shoes,” Chain said with a big laugh. Chain was a high school principal in New Albany and a director of personnel at UM, and has held many leadership positions. His sense of duty and lessons about being in charge that he learned in Ole Miss ROTC were instrumental in his success, he said. ROTC remains important for young men and women, he said. He’s a member of the Ole Miss Army ROTC Hall Of Fame and helped start the group’s alumni club in the early 1990s. The chapter remains active and tailgates in the Grove on football Saturdays in the fall. They stay connected with recent graduates and current ROTC programs, offering their services as mentors and giving networking opportunities to those students. Chain said this is rewarding. Retired Col. Bobby Towery, who was a member of the Ole Miss ROTC during the early 1980s, embarked on a successful career in the military that spanned 30 years after being commissioned into the Army in 1983. Towery was a professor of military science at Ole Miss in the early 1990s, and was among the group that helped start the alumni chapter. He also served as deputy commandant at the U.S. Army War College at Carlisle Barracks in Pennsylvania. He retired from the Army in 2013 after a decorated career that included the Distinguished Service Medal, Legion of Merit, Bronze Star Medal, Meritorious Service Medal and the Army Commendation Medal for Valor. Towery, who is also a member of the UM Army ROTC Hall of Fame, remembers Ole Miss at it was in the 1980s. He recalls spending time at the rifle range, which was near Guyton Hall, and exercises on the large parade field, now site of the National Center for Physical Acoustics, where 500-600 ROTC cadets trained. Cadets also spent a lot of time on the rappelling tower near Tad Smith Coliseum, where they honed their skills, Towery recalled. Mississippi Army National Guard helicopter rides also helped students prepare for life in uniform. He credits the university’s proximity to many public use lands, including Desoto National Forest, Sardis Reservoir and now, the South Campus Trails and the expansive wilderness around them, as being a great asset to training that many other universities may not have at their disposal. These lands have been used over the years, including in the 1960s when military science professor Max Waldrop was training students to go to war in jungles of Vietnam. Many also entered the Korean War, World War II and conflicts in the Middle East. Retired Brig. Gen. David Smith, an Ole Miss ROTC alumnus from Madison who graduated in 1985, spent 38 years in boots. Also a member of the UM Army ROTC Hall of Fame, Smith remembers his time era of Ole Miss ROTC fondly. It was transitional for the Army, having withdrawn from Vietnam in the mid-1970s and shifting its focus to the Cold War in the ’80s. President Ronald Reagan had initiated an arms race in hopes of crushing the will of the Soviet Union by growing the U.S. military at a rate at which the Russians couldn’t compete. “It was a great experience,” Smith said. “I made lifelong friendships in that program, which had a great mix of people. The National Guard was getting very much involved in that point, and we were raising a lot of officers in those days. The Army was expanding. As it marks its 100th anniversary, Ole Miss Army ROTC can boast an impressive list of officers who have come through its ranks, Douglas said.